Page revised in August 2018. The locations covered in this section were visited in May 2008. Oxus was the ancient Greek name of the Amu Daria River and Transoxiana (beyond the Oxus) was the region between this river and the Yaxarte (Syr Daria River). The city of Samarkand is located in a fertile valley midway between these two rivers. Its name most likely means city (kand) of Samar, its mythological founder. In antiquity the region was part of the Persian Empire; it was conquered by Alexander the Great in 329 BC; he discovered inside the walls of Samarkand one of the most impressive cities of the ancient world: its walls had a length of eight miles. The Hellenistic kingdom which was founded by Alexander did not last long under the pressure of nomadic tribes; Samarkand became part of the Kushan Empire which at one point included most of northern India. The relevance of Samarkand declined for some time but in the early VIIth century AD it was again described as a very flourishing city. The predominant Persian culture spread into the region the teachings of Zarathustra, including the practice of praying in front of a fire. When the Arabs conquered Samarkand they regarded its inhabitants as fire worshippers and took radical steps to eradicate what they thought was idolatry. Eventually Islam became the only faith, but the process was painful. From Central Asia the Arabs moved towards China and from Chinese prisoners they learnt the secrets of manufacturing paper. According to Byzantine sources paper became one of the commodities traded along the Silk Road; in Constantinople paper was called Baghdad Papyrus, because the Arabs had established paper mills in their capital. Samarkand remained for centuries a nominal possession of the Baghdad Caliph, but the actual rulers were Turks who belonged to different tribes (Kara-Khanids, Seljuks, Khwarezms). In particular the occupation by the Khwarezms (who had their base near Khiva) greatly reduced the population of Samarkand which a few years later (in 1220) was destroyed by the Mongols. Samarkand slowly recovered from the Mongol invasion, but the city was rebuilt a few miles to the south of the old one. This explains why Samarkand does not have monuments of its ancient past. In 1369 Timur, a warlord who had gained control over much of the region, chose Samarkand as the capital of his possessions. In the next thirty years Timur waged war on all the neighbouring countries and established one of the largest known empires. "Then shal my native city Samarcanda. And cast the fame of Ilions Tower to hell. (Christopher Marlowe - Tamburlaine - Part Two - Act Four - Scene Three). Timur claimed he was acting as a Ghazi (warrior for the faith) but he mostly waged war on other Muslim states. While he became famous for his massacres of Hindus in India and Christians in Syria, he nonetheless did not spare the Muslim inhabitants of Baghdad and Damascus. In 1401 he invaded Anatolia and defeated the Ottoman Sultan Bayezid I at Ankara and he even reached the shores of the Aegean Sea by taking Smyrna, which then was a possession of the Knights of Rhodes. Timur did not spare resources in order to embellish Samarkand. Skilled artisans and masses of slaves were transferred there together with elephants, timber and rare stones. While Timur claimed to be a legitimate heir of the Mongol Empire and promoted the use of the Turkish language, the prevailing culture in his vast empire was the Persian one and the architecture of the monuments he built at Samarkand follows Persian patterns. 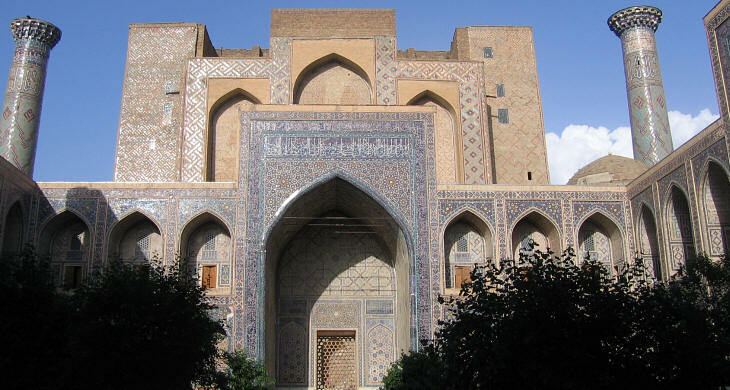 Medreses (theological schools) are the most important monuments of Samarkand. A traditional medrese was composed of a rectangular courtyard surrounded by the cells for the students: it housed a small mosque and some larger rooms where students had their lessons when they could not meet in the courtyard. A medrese per se is not a building which seems apt to become a symbol of the strength and wealth of an empire, yet the Seljuks did so in Anatolia by building very large and decorated portals (pishtaq) for their medreses at Konya, Karaman and Sivas. In Samarkand during the rule of Timur and his heirs this approach evolved into the construction of portals of a gigantic dimension. The Registan is located at the centre of Samarkand and it is regarded as its most monumental site: it is a rectangular square having on three sides a medrese which is characterized by a gigantic portal. What we see today is the result of a restoration/reconstruction which lasted twenty years (1967-87); it has led to a Registan which is very bright and impressive, but which never was like this in the past. The three medreses were built during a period which spans from the early XVth century to the middle of the XVIIth century. For this reason they never looked all "brand new" at the same time as they do after the restoration. At the time of Timur Registan (the name means place of sand) was the trading centre of Samarkand, an open air space where merchants placed their tents in front of a bazaar built by Touman Aka, Timur's youngest wife. Ouloug Beg, grandson of Timur, was not as keen on spending his life in the battlefield: astronomy was his great passion and he decided to replace the bazaar with a kulliye, a complex of buildings made up of a mosque, a caravanserai, a hammam, a monastery and an enormous medrese where students were taught astronomy in addition to traditional religious matters. The medrese was entirely decorated with glazed tiles, not only the portal or the iwan (large niche) in the courtyard, but even the cells of the students. Because Ouloug Beg was fond of astronomy, stars are a recurring theme of the decoration. The empire founded by Timur did not last long; in 1498 his heir Babur was dislodged from Samarkand by the Shaybanids (Uzbeks). Later on Babur founded the Mogul Empire in northern India. Earthquakes, the action of high seasonal and daily temperature fluctuations due to the very continental climate of the region and lack of maintenance greatly damaged most of the buildings of Registan. At the beginning of the XVIIth century, Alchin Yalantush Bahadur, a Shaybanid governor of Samarkand, decided to build a second gigantic medrese on the site of the monastery. The rubble of the monastery was used for the new building, which is not identical to Ouloug Beg's medrese because of a religious prohibition of symmetry. Its portal is characterized by two lions bearing the sun (Chir Dor = lion bearing). 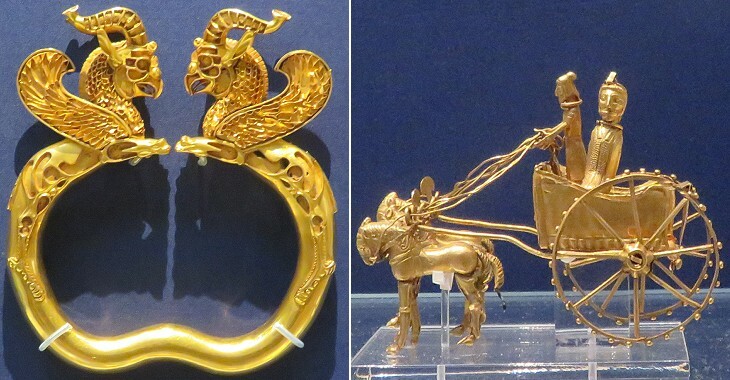 This motif which violated Islamic conventions seems to have a Mongol origin and because the Shaybanids (as well as Timur) regarded themselves as the heirs of the Great Mongol Empire, the lions most likely had a political significance. A few years later Yalantush Baladur built a third medrese (Tilia Kari = gold covered) on the site of the caravanserai. The design of this medrese marked a change from previous patterns in two respects: the portal is characterized by a deeply recessed niche and the medrese mosque is a large building with an imposing dome which attracts the attention of the viewer. In the late XVIIIth century Tchorsou, a small vaulted bazaar, was built behind Chir Dor Medrese. The image used as background for this page shows a lion of Chir Dor Medrese as portrayed in an Uzbek banknote.